This report aims to lay out a framework for understanding by the outsourcing practices of the famous ice-cream and coffee parlor of the world Movenpick is correlated with its overall sales. Ice cream was first eaten over 3,000 years ago, but back then it was more ice than cream. It took another 200 years for the first ice cream factory to be set up (in America), and in 1904, a Syrian waffle vendor named E.A Hamwi teamed up with an ice cream vendor at the St. Louis World Fair and served the first ice cream cone. Fifteen years later, in 1919, the start of prohibition in the US saw many bar owners convert their now unlawful space into ice cream parlors, and ice cream’s popularity boomed. MÖVENPICK is a Switzerland brand of ice-cream with a motto of quality, natural materials and non-usage of artificial flavorings and chemicals. Aside from the fact that ice-cream in itself is tempting, MÖVENPICK specializes in double-flavor combos. It is a truly delicious, all natural ice cream with an authentic taste that enriches the consumers moment’s of pleasure. The ice-cream has a unique wave-like pattern, is rich in dairy and is made from the best fruit, treating your taste buds to a fine feast. It is no wonder MÖVENPICK is acclaimed as the world’s top. Ice-cream at MÖVENPICK does not change with each season. So, summer fruity flavors are combined with winter nuts such as walnuts and viola, it’s a whole new experience. There are 14 flavors to choose from, but vanilla, chocolate and strawberry remain the most popular. Maple syrup walnut is also up there on the popularity scale. The newest summer flavor addition is pistachio, macchiato coffee and crème Brule. Any person eager to experience the true inner coolness, MÖVENPICK won’t let him/her down. MÖVENPICK of Switzerland is uncompromisingly strict about the quality of the ingredients and where they come from. Carefully selected raw ingredients from the world`s finest possible sources are used in making the product. MÖVENPICK products are sold through authorized service locations in South Asia. « We do nothing extraordinary; our success lies in the fact that we do simple things in an extraordinary way. » Ueli Prager, founder of MÖVENPICK. The popular MÖVENPICK Ice Cream creation originated since at the beginning of April 2003 from the house Nestlé. MÖVENPICK Holding sold the world-wide trademark laws for MÖVENPICK Ice Cream by 1 April 2003 at Nestlé S.A. Since that time the MÖVENPICK Ice Cream business is led of Nestlé as independent Business unit and positioned invariably as hochklassiges product. MÖVENPICK started operating in our country on 21st March, 2000. It is situated on the 2nd floor of a 5-storied building at Gulshan opposite to Wonderland near the Gulshan #2 circle. Currently, the shop has a team of 17 employees. Among them is included the Manager and 3 security guards. The address of MÖVENPICK is: 121 C, Gulshan Avenue Dhaka – 1212, Bangladesh. Phone: 8802017631247. I already said that, MÖVENPICK is a Switzerland brand of ice-cream with a motto of quality, natural materials and non-usage of artificial flavorings and chemicals. Aside from the fact that ice-cream in itself is tempting, MÖVENPICK specializes in double-flavor combos. It is a truly delicious, all natural ice cream with an authentic taste that enriches the consumers moment’s of pleasure. The ice-cream has a unique wave-like pattern, is rich in dairy and is made from the best fruit, treating your taste buds to a fine feast. It is no wonder MÖVENPICK is acclaimed as the world’s top. Ice-cream at MÖVENPICK does not change with each season. So, summer fruity flavors are combined with winter nuts such as walnuts and viola, it’s a whole new experience. There are 14 flavors to choose from, but vanilla, chocolate and strawberry remain the most popular. Maple syrup walnut is also up there on the popularity scale. The newest summer flavor addition is pistachio, macchiato coffee and crème Brule. For MÖVENPICK Bangladesh, the ambient conditions refer to the background characteristics such as: temperature, air quality, noise level, music, lighting and scent of the shop. All these actually affect employee performance and morale as well as customers’ perceptions of the service, how long they stay, and how much money they spend. Although many of these characteristics are influenced primarily by the design of the building (e.g., the placement of light fixtures, acoustic tiles, and exhaust fans), the layout within a building also has an effect. Areas near food preparation will smell like food, lighting in a hallway outside a theatre must be dim, tables near a stage will be noisy, and locations near an entrance will be drifty. 1) Temperature and air quality: The temperature of MÖVENPICK is quite cool. Being one of the top ice-cream parlors, they can’t help keeping the entire compound colder than the outside temperature. A total of 6 air-conditioners are constantly operating do to so. As frozen products, ice creams and sorbets are kept at a constant temperature below minus 18 °C. Temperature changes would have a considerable effect on the texture and creaminess of the ice cream. If the ice cream becomes crystalline and flakes have formed on the surface, there is a good chance that the cold chain would get broken at some point. Moreover, the quality of the air is ok. There is no dust. 2) Noise: There is no specific level of silence required and applicable for the customers of MÖVENPICK. This is a gentleman’s place and teenagers hang out here, too. During daily peak hours that usually starts from 7:00 pm and go on till midnight and at various occasions (such as: Eid, Christmas, Pohela Baishakh etc. ), there are some interactions that go on among customers, which does not exceed the limit and create any disturbance. And the whole compound being completely airtight, outside road noises are not that much to hamper anyone. But still the inner room is comparatively more protected from outside traffic noises. 3) Music: There is always some music going on at MÖVENPICK. The volume is light, making the environment more pleasant. In the first room, there are 3 small sized black Crěative speakers hanging on the top of the wall. The management basically prefers fusion, slow rock, techno and instrumental sort of genre. The music makes a peaceful atmosphere, but does not seem overwhelming. 4) Lighting: MÖVENPICK’s lighting is very bright, which makes everything look clean and inviting. There are 54 spotlights in total at the shop. Among them, 13 are in the first room and the rest is in the other. There are 3 hanging lamps in the first room where 3 additional spotlights highlight a big MÖVENPICK wall-portrait in the second room. 2 big halogen lights focus the label ‘MÖVENPICK’ right on the entrance. Overall, the lighting is quite good and adequate to make the place more attractive. This also adds to the home-like environment. 5) Odor: When a person walks in the door of the shop, he/she is immediately overwhelmed by the strong smell of fresh ice-creams, which are located in the front desk. Again, there is also a scent of caffeine. In addition, various ice-cream flavors give a mixed fragrance such as: chocolate, vanilla, different fruit smell and so on. Besides all these, the management uses two types of air fresheners like: Lotion Admire and Angelica (lemon flavor). In South Asia, the outlets that are operational have been categorized as Ice Cream Kiosks as they are not a franchise model but are individually owned and operated outlets. The franchise model of MÖVENPICK Swiss Premium Ice Cream is the Ice Cream Gallery which is not yet executed in the region. Hence, we will concentrate on the characteristics of an Ice Cream Kiosk, which is the basic model in operation in this region. The Ice Cream kiosk is primarily an over the counter (OTC) sales unit, which can be located both indoors and outdoors, can be a walled structure or without walls. It needs less than 30 sq mts of space. The unit comprises of a scooping station with a cone baking station. The layout will be location specific but will need a counter length of not less than 10ft. The Outlet space is divided primarily into the front counter and the back area. MOVENPICK also involved with outsourcing business. Before discuss about the outsourcing activities of MOVENPIC, we have to know what is outsourcing & what are the impacts of outsourcing activities in business.Outsourcing, in literal terms, means sourcing from outside. The term is increasingly used to refer to sub-contracting of a set of functions or processes by one firm to another, or to a group of individuals. The latter organization is often in another physical location, or another country altogether. Outsourcing is being pursued as an active business strategy in the current economic scenario, since it enables a firm to focus on core-competency areas. It also frees the firm from resource and labour intensive functions, which are now performed by trained personnel at much lower costs. MOVENPICK outsources human resource from different country and different organization. The peoples are very much trained about the activities. There are many organizations in the world, who serve the human resource to other organization or other country. They train the people and serve them to other organization or other country. MOVIENPICK also hire the human resource from the organizations. But it is occasionally. When they arrange some big program or function then they hire the people for advanced work. The human resource are very much expert for the activities. MOVENPICK is a Switzerland brand of ice-cream and they have a strong goodwill in all over the world in ice-cream business. For this reason they choose the outsourcing system in their business. Today there are very much competition in business. To establish a strong position & gain more profit in market it is very much important for the companies to choose the outsourcing system. MOVENPICK also follow the activities. MOVENPIC outsources the human resource from Australia, Denmark, New Zealand, Sweden, France and Germany. Finally the impact on performance is good service quality, good managerial activities, to gain customer satisfaction, time consume, better profit, etc. I already said that, MÖVENPICK is a Switzerland brand of ice-cream, to make ice-cream they outsource some raw-materials from other countries. To make a good quality ice-cream & maintain the goodwill of the company they outsource the raw-materials from different countries. For this reason they can collect good raw-materials & save the production cost. They collect fruits, coco powder, vanilla, coffee, many types of flavors etc from other countries. They collect fruits from Bhutan, China, Taiwan, & Germany. They collect coco powder & vanilla from Denmark & Sweden. They collect the coffee from Africa. Finally the impact on performance is good quality products, to gain customer satisfaction, good quality raw-materials, better profit, etc. MOVENPICK decorate their some show-rooms from French & German architecture. The lighting, show pieces and the wall decorations of MOVENPICK is very good. The show-rooms focus the brand image of MOVIENPICK. 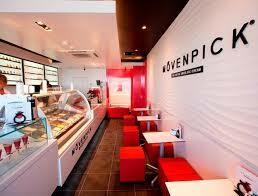 Beside the good quality ice-cream the show-rooms are also focus the good image for MOVENPICK. Finally the impact on performance is good quality products, to gain customer satisfaction, good environment, better profit, etc. For advertising MOVENPICK outsources some world reputed advertising agencies. The agencies make advertisement for MOVIENPICK, which are more effective for MOVENPIC performance. The advertising agencies are Omnicom Group, WPP, Hava, Sapient, Dentsu. Finally the impact on performance is focus the quality products, to gain customer satisfaction, focus the brand image, better profit, etc. 1) They have a strong market position in the world. 2) The customer demand of MOVENPIC is very high. And they maintain the demand to use outsource. 3) They create brand image for the customers to use outsource. 4) They produce large amount of products to use outsource. 5) They decorate their show-rooms to use outsource. For this reason the can attract the customers. 6) They focus their activities to use advertising, for good advertising they outsource. 2) Sometimes communication problem creates some problems. 3) Same types of activities involved in the work. 4) Sometime it is very hard in operations. 1) Outsource from more reputed organization. 2) Outsource from more developed countries. 3) Outsource more expert human resource from different organization & different organization. 4) Collect the best raw-materials from other countries. 5) To choose world best architecture for decoration the showrooms. 6) More outsource for advertising. At the end of summary, I want to say MOVENPICK is a very famous organization in the world. Obviously they do outsource for their organization profit. There are some bad affect beside the good effect of outsource. But always we have to follow the good side. Because it can create the better opportunity for the organization, and organization can gain more profit for outsourcing business. MÖVENPICK is mostly satiated with positive customer responses. But at times, some customers feel irritated because of situations like late serving, lack of seats and such. As MÖVENPICK is kind of a congested zone compared to its popularity, they are unable to accommodate large group of customers time to time. This type of situation basically occurs during festivals like: Eid, Christmas, New Year’s Eve, Pohela Baishakh and so on. That’s why; it should be a concern for MÖVENPICK to increase their floor space; for example: by shifting to a wide spacious place where they can serve more customers at a time. They can also open up new branches in some other places like: Dhanmondi and Chittagong. By taking these initiatives, they can both lessen some pressure from the single outlet and at the same time, be able to attract more potential customers. MÖVENPICK is basically a café where color, texture, ingredients; everything is taken into account. And at MÖVENPICK, although quality is primarily judged by taste, it also depends on strict requirements with regard to the quality of ingredients, faultless controls and uncompromising hygiene regulations. Its services cape is all about elegance and perfection. Again, from the ingenuity of the production process to the exactitude of control procedures, every aspect contributes to making every MÖVENPICK factory a very modern production tool, which is both competitive and environmentally-friendly, and to ensuring that their products are the very best in ice cream production.